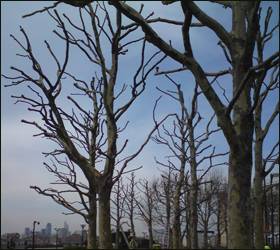 Crown reduction is used to reduce the height and/or spread of a tree's crown by removing the end of branches whilst maintaining the natural shape of the tree. Reduction are usually specified in a percentage (e.g. reduce crown by 25%) or an absolute amount (e.g. reduce crown by 3m). 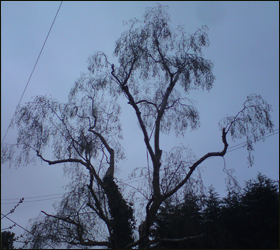 Crown lifting is removal of the lowest branches and preparing of lower branches for future removal, normally to give a uniform height from ground level. Good practice dictates crown lifting should not normally include the removal of large branches growing directly from the trunk as this causes large wounds which may jeopardise the long term future of the tree. Common reasons for crown lifting are to bring more light and give access for traffic. In the U.K. common practice dictates clearance for vehicles is 5.2 metres (~17 feet), and for pedestrians 2.5m (~8 feet). A Crown Thin involves the removal of a proportion of secondary branches to produce a uniform branch structure without altering the overall size or shape of the tree. It results in improved light levels passing through the canopy thus reducing shading. It reduces the wind resistance of the crown and reduces the loading upon the limbs of the tree. Aswell as the increased light passing through the canopy, this method is also commonly used to remove damaged defective small limbs throughout the tree that are crossing, rubbing or even dead and will in the end just cause problems in regards to the tree's health and your saftey. Thinning is usually specified as a percentage (e.g. thin crown by 15%). The removal of all brances from the trunk to leave only a trunk, or stems. The tree will than sprout growth from the cuts creating a 'pollard head' which is than usually re-pollarded every 2-3 years. Generally pollarding is performed to make a tree more manageable and promote continous yearly growth, aswell as keeping the tree at a regulated size. Examples of these methods of work can be found in the image gallery.